Lifesaving Resources provides Aquatics Safety, Water Rescue and Ice Rescue training programs and consulting services for the Public Safety and Rescue Sector, the Lifeguard and Aquatic Recreation Sector, and the General Public. To prevent and/or reduce the number of drownings and aquatic injuries through the education and training of Public Safety & Rescue Professionals; Lifeguard & Aquatic Recreation Professionals; and the General Public. 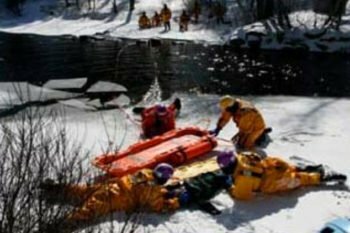 Lifesaving Resources sponsors and conducts annual 4-day Instructor Academies for the purpose of training Water Rescue and Ice Rescue Instructors for Public Safety and Rescue agencies from throughout North America. Upon successful completion of an Academy, graduates are authorized as either Water Rescue or Ice Rescue instructors to conduct courses and certify their personnel at the Awareness, Operations and/or Technician level on behalf of their respective agencies. These courses meet/exceed NFPA 1670 and NFPA 1006, and certification is valid for 5 years from the course completion date. Customized Academies can be conducted at the request of Fire, Rescue, EMS, and/or Law Enforcement agencies. Customized Academies require 4 days of instruction and are dependent upon availability of local lodging, facilities, and faculty, with a minimum enrollment of 6 instructor candidates. Survival chances increase when EMT-trained firefighters are dual-dispatched with EMS units, as shorter response directly correspond with survival rates. its’ beauty, strength or force. it empowers us and commands respect. Currently authorized Lifesaving Resources Ice and Water Rescue Instructors have direct access to course instructional materials, administrative forms, etc. within the Instructor Portal. Click below to access the portal using your assigned PASSWORD. Please contact Lifesaving Resources for that password and e-mail [email protected] to receive the latest POWERPOINT or KEYNOTE.